I’ve always been a pet lover. I remember when I was 7, my great-uncle Benji said to my parents, “Allison needs a dog.” It was at that time, my life changed. I was a very quiet, reserved kid, but dogs brought me out of my shell and taught me lessons as my life began to unfold. They were with me during good times, painful times and major life events, and loved me no matter how I reacted to these situations. They remained stable forces in my life, even during the darkest turmoil. For example, my dog Charity stayed with me during the final days of my grandmother’s life. Charity was a healthy dog, but as I sat by my grandmother’s bed, she became sick, which forced me out of my immediate pain and suffering to divert attention to taking care of her. She suddenly became “well” after my grandmother passed away. She seemed to know how I was feeling, even when I had trouble expressing it myself. Charity stayed by my side, giving love and attention that dogs are so good at providing. I often ask myself whether I’m treating others and living my own life as my dogs do. Am I loving without conditions, judgments or expectations? Am I living in the moment, or do I let the past cast shadows on the present? Do I worry about future issues that may or may not happen? Living life through the eyes of a dog is a challenge, but trying to do so is slowly changing my life. When I find myself defaulting to old habits and patterns, I try to recognize them, which makes them easier to deal with. It brings an almost immediate sense of calm and appreciation that would have gotten lost in the turbulent thoughts that used to take me off course. I’m able to stay on my path without so many diversions. And I use the same skills from my toolbox to teach others who also want to gain more joy in their lives. I saw amazing results when I took my two certified therapy dogs on visits to a children’s home. Charity seemed to use her sixth sense to identify which child needed extra attention. I watched as she “worked” the room, going to the child who was quiet and reserved, but who lit up when she sank her head into the child’s hands. I started becoming more aware of how she interacted with these kids, using an unassuming presence without expectation or reward. She just sat by them, until finally, their hands reached out to touch her. She let them initiate the first step before moving closer. Then, beside even the most resistant child, she would roll over to get her belly rubbed, to the glee of the child. She loved her visits with “her” kids and knew whenever it was time to visit, waiting patiently by the back door as I prepared her therapy vest and tags. The uniform turned her into a dog on a mission, and she took her job very seriously. 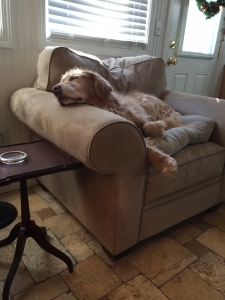 Chip, my golden retriever, takes his job very seriously too. He patiently watches leaves and twigs fall, then runs around gathering them into piles that he quickly shreds into small pieces. He spends a long time on this task, stopping only when I call him inside. He loves his sticks and could be satisfied spending every waking hour gathering them and shredding them. The day in the life of a dog … it doesn’t get any better! I practiced enjoying the moment as I watched Chip sleep peacefully in a chair on this lazy Sunday morning. A ray of sunlight beamed onto his head as he snored. I stopped writing my grocery list to capture the feeling of serenity and happiness, while watching his legs move as he dreamed. How I love this dog. His mission in life is to bring me dirty socks, towels and sticks, and to roll in anything muddy. Oh, and to bring me his beloved tennis balls! I finished my “to do” list with a different appreciation for the day and what was really important for me to accomplish. All is well for me … in this moment. I work with clients who have chronic issues such as depression, anxiety and addictions, and they don’t always feel like there is hope. It’s hard for them to see there is light on the other side of the darkness, and peace seems so far away. As I use my dogs during pet therapy visits, I see that spending time with animals brightens up a person’s mood and brings joy, even if it’s for a short time. That moment allows a small trickle of light into that person’s heart, which may not have been there before. During one session, a client asked if she could get on the floor because she wanted to talk to my therapy dog about something “very important.” She buried her head into my dog’s fur and told her about the horrible week she had endured. As she stroked my dog’s fur, I could see a sense of calm overtake my client in a way I could not have accomplished by merely talking with her. No judgments, no expectations – just a furry hug. When we’re facing despair, loneliness, chronic health issues, depression, addictions, or anything beyond our ability to cope, a pet may help ease the pain. He or she can give us a reason to get out of ourselves and our thoughts to focus on a sense of purpose, meaning. Even pictures of pets can warm our hearts and make us laugh. I keep cute animal pictures readily available for a quick pick-me-up. The relationship we have with our pets is real and symbiotic. What I give to my pets comes back to me in ways that can’t be measured. If you’re not able to own a pet, there are many ways to reap the benefits of a pet relationship. Volunteering at a local shelter or helping rescue groups or therapy dog organizations are ways to save pets’ lives, and possibly your own. Wildlife photographer, author and television personality Roger Caras said it best when he stated, “Dogs are not our whole lives, but they make our lives whole.” Now, go enjoy a pet, and allow yourself to reap the benefits he or she will so generously give back to you.